The moon, Mars and the Pleaides in the New York sky on April 8 at 9:30 p.m. EDT. 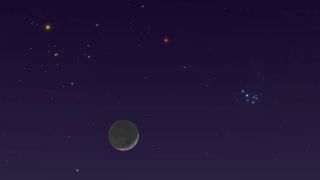 Tuesday after sunset, the four-day-old waxing crescent moon will swoop below — or to the south of — Mars, passing just 4.7 degrees south of the Red Planet. The two will share the same right ascension, according to the skywatching website In-The-Sky.org — a designation like celestial longitude that can be used to locate where an object is along the celestial equator. Skywatchers will be able to find the pair in the constellation Taurus. The planet's closest approach, known as an appulse, will come Tuesday morning at 4:51 a.m. EDT (0841 GMT) — precisely two hours after the moment of conjunction. While Mars will fade in brightness throughout April, the planet will still be bright in the sky Tuesday night at magnitude 1.5, while the moon will be at magnitude -10.7 — lower magnitudes are brighter. For those in New York City, the pair of objects will become visible starting at 7:42 p.m. EDT (2342 GMT), and they will be visible at about 40 degrees above the western horizon. As the night goes on, the moon and Mars will slowly dip toward the horizon, until they finally set at 11:25 p.m. EDT (0325 GMT) — 4 hours and 2 minutes after the sun sets. The moon-Mars conjunction April 8, 2019. For skywatchers counting the minutes until the conjunction occurs, the moon and Mars will be too far apart to be visible through a telescope. However, with the naked eye or even a pair of binoculars, they should be easy to spot in the sky. Venus and Neptune will also be in conjunction tomorrow night as Venus swoops under — or to the south of — Neptune, passing 0.3 degrees to the south of the planet. Unfortunately, the two planets will not be as easy to see as Mars and the moon. At no more than 8 degrees above the horizon, they will be tough to spot. (Your outstretched fist covers about 10 degrees of the sky.) However, the pair will be close enough to be seen through a telescope or a pair of binoculars. For those looking for the planets, they can be found within the constellation Aquarius. A conjunction between Venus and Neptune in the early morning April 9, 2019, over Buenos Aires.